The leaves are starting to change around here, as I look up at the mountain ridge. Its a great time of year! We've had a few crispy mornings over the weekend. Must mean it really is Autumn outside! I headed out to some fall festivals yesterday with a friend. Hit up some yard sales on the way home as well. It was definately time well spent. With it being fall, I must get a move on a few more Christmas cards. I was trying to get about 5 a month, during the summer and made 1.. period!!! So now I really must bust thru some. I used the Playdate Cafe colors to push me through some not so traditional ones. Using the new Evergreen, was helpful since it has a sentiment with it. 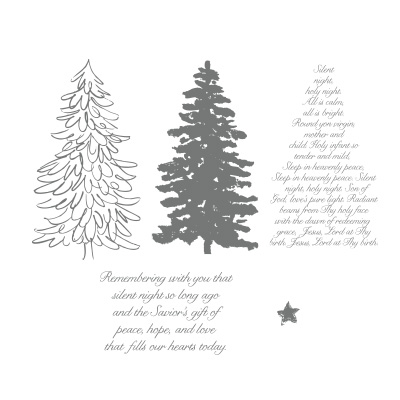 I used the Apothecary framelits to cut out the tree, and then used the new Scalloped Tulle for a bow at the base of the tree. 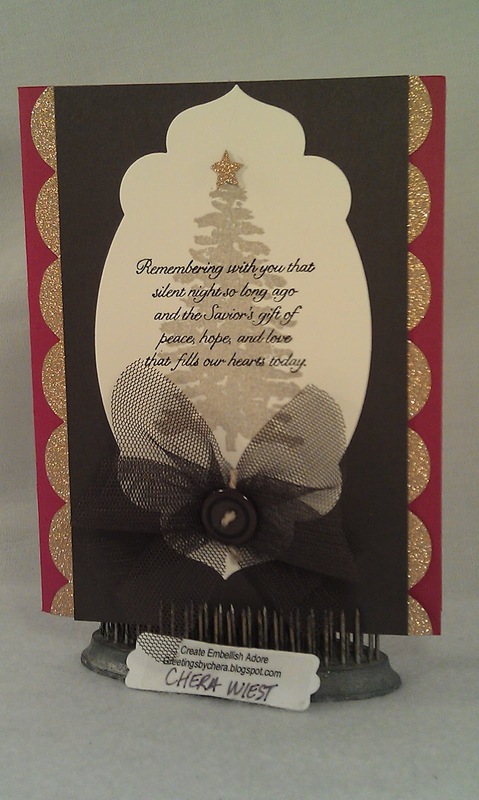 I used some Glimmer paper with the scallopped Trim (Tasteful Trim - Big Shot) on the sides. 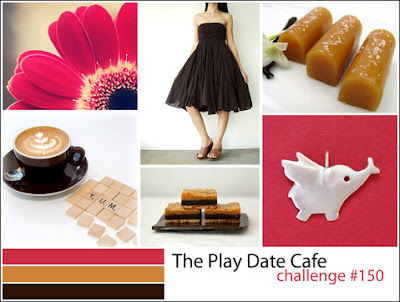 There is still time to play at the PLAYDATE CAFE! gorgeous card! Thanks for joining us at The Play Date Cafe! 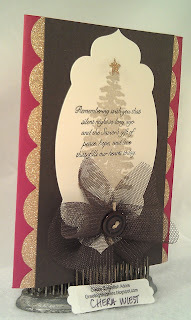 I love this color scheme for the holidays and love that glittery paper you used. Glad you had fun with your friend this weekend. LOL about the summertime Christmas cards...I can relate. The glitter and the silhouette tree are beautiful! Fabulous card! Thanks for playing along with us at The Play Date Cafe!